My grandmother told me to plant half runners this year, and I've been waiting for them to get long and plump. I finally had a day I could go pick a batch from the garden. When I brought them up, I had a helper to string them for me while I chopped potatoes and onions and garlic. Our HVAC had died and we were trying not to heat up the house, so I cooked them on the grill burner. They were delicious! I am hoping I will have enough to can a bunch in addition to eating them fresh. I love green beans. with this heat, I'm a half runner! My son would love you forever too he is the biggest green bean fan I know of. He would be right there helping as well. I like beans stir fried with soy, ginger and some garlic. How delicious!!! I hope you get your a/c running soon. What an adorable picture! 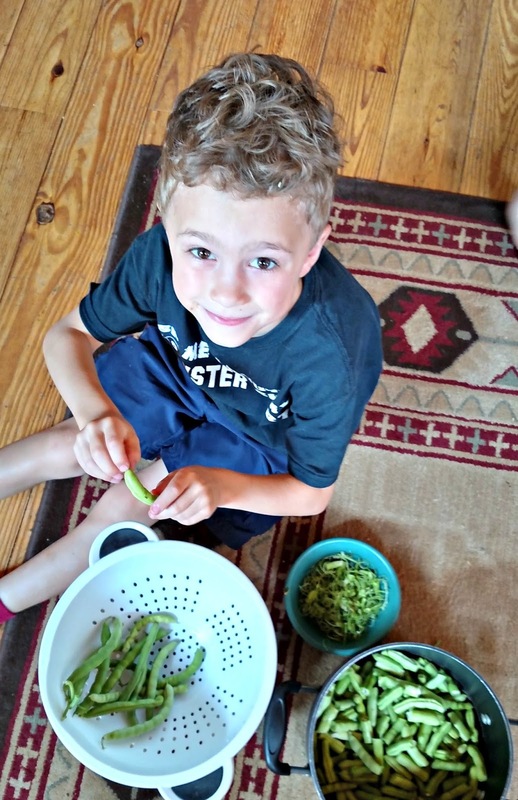 I believe in teaching boys to cook, so they can take care of themselves when they move out. I have never heard of this kind of beans, but I love green beans. Are there any whole runners? Will you wait till next year to get your air fixed? Thankfully it is to get a bit cooler the rest of the week. I've never heard of half runners--is that another name for green beans, or a type of green beans? I bet they taste good. And what a cute helper you had! I looks like you have a great helper there. We just canned tomato sauce this last weekend. I want to work on jam, but will wait until the weather cools down a bit. What a cute helper, Lisa! I love green beans with onion and new potatoes-yum. Yum! Fresh from the garden...can't be beat! Hope the air is fixed soon. And without too much effort and change. This variety was my mom's favorite and is what John always grew for her. Your helper is so sweet. Hope you get your AC fixed soon.. It's been SO hot here... Maybe it's not as hot where you are... I HOPE. Good job all the way around. You sure had a precious little helper there, Lisa. I hadn't heard the term half runners, but they sure look nice. cooking in a grill? Sure sound delicious .